When you open the door of Alter'hostel, you feel immediatly the natural light from the glass roof. At the front desk, someone will welcome you with smile and will explain you why we are not an hostel like the others. Our guests often say "we feel like home". 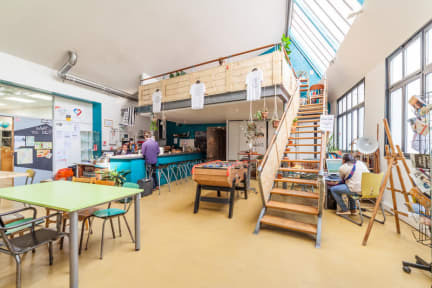 And they like usefull shared kitchen, our green vibes, our events when you'll meet local people and more activities (rental kayaks and bikes, DIY workshops, volunteering in local organisations, radio to share experiences....). Each beds are equipped with a curtain to give you your own space, a light, a table bed, plugs. Dorms are also large and luminous. For your security, we provide free lockers and free luggage room. In case you don't have your padlock, you can get one in exchange of a 10€ deposit. Alter'hostel is located along the Saône river. From the quay, you'll see the basilica of Fourvière on the top of old town hill (Vieux Lyon). By boat (vaporetto), by walking or bike, by bus or subway, you'll easily get to the most attractive part of Lyon. •Smoking, Pets, Visitors and Alcohol is prohibited in the hostel. Great environment and theme, comfortable and super clean! It was a great place to stay, it's a little bit far from the train stations but it's definitely worth what you pay for. Bathrooms are clean but there aren't that many. It has nice living rooms to chill and talk with others. Rooms are fine. Very easy to meet people. The hostel isn't too far of a walk to Vieux Lyon (maybe 20 minutes or so), and then maybe 30 minutes to the shopping centre. There are no keys to get into the hostel, nor are there keys to get into the individual rooms. The lockers for each bed are very large (I managed to fit everything into my locker), but for some rooms their lockers are in the hallway. There are 3 toilets for 40 beds, but the showers are fantastic. Was a good experience except as they keep the windows open in the rooms during the day I think a mosquito got trapped and on my last night I got absolutely bitten alive. Aside from that it was pleasant. Overall, it was a nice place, BUT my friend did see a bedbug. She told the staff and they gave her new sheets, as well as cleaning the bed the following day when we were out. Still a bit icky, but bed bugs can be a problem even in high-end hotels. We really enjoyed relaxing in the common area, which was huge and bright and gorgeous. I really liked their focus on being environmentally friendly, too. A hostel that is aware of its impact on the environment, quite nice to see! The location is a bit far from the train station (part dieu) however me and my friends walked everywhere quite easily. But be prepared to walk. Privacy and facilities were good, a kitchen complete with most things! Atmosphere was not great, as everyone spoke French and did not interact with us, people of all ages were there. Clean and great stuff. Liiiiiitle bit more far away from the centre, but still walkable and the entrance is quite hard to find and doesnt look very safe, but it is. The ppl in the hostel were super non-talkative, but that might be just some strange coincidence.